As mentioned in my previous post, Menu planning. I really don't know why it is that I find it so very difficult to sit and write down 14 meals and a shopping list. I first thought that meal/menu planning would be something beneficial about a year or so ago, I asked my on line friends and gathered information. It all just seemed too hard. So I put it off for about a year lol. I can't remember exactly what it was that pushed me into it, or motivated me to try it earlier this year, but once I had done it OMGoodness, what a wonderful change it bought to my life! Not having to rummage through the fridge and cupboards only to to find I was missing an ingredient, no procrastinating over the meal preparation as I didn't know what to cook, no last minute take aways, money savings, energy savings and stress reduction! Yet still sitting to do the plan sometimes presents itself as a mountain I do not want to climb. I began by writing out a list of meals that we typically eat or I find easy to prepare. 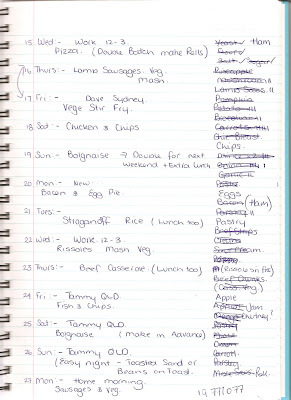 Then this list originally just became my plan, I had got it out to 14 meals. My process has evolved from there. I utilise two on line tools in my process which are the Vegies to your door site and Best Recipes . I am happy to pay a delivery fee to vegies To your door, when they select produce of the quality I would myself and can deliver locally sourced delicious meat! Yes the meat is more expensive than what we were buying but it worth it IMO. They cut out the hassle of shopping with kids at markets, for me this is a stressful experience that I will try again when the kids are a little older but for now I'd rather pay the $ and save some sanity. Best recipes allows me to incorporate new meals into our plan as I see something I like and store it in my personal 'To try' recipe book. So if I see a particular special at VTYD then I can see if I have a recipe that I can utilise it in. So down to the actual planning I write it all up in a big spiral notebook. With a date and any note relevant to the day or meal. For example if I am working all day, or Hubby is away. I also not if I want to get a lunch serve for his freezer stash from that meal. I do try to have some easy on hand options pre prepped in the freezer for the times it falls down. Like rissoles, a frozen pasta sauce or crumbed chicken etc This is not always the case though. I check it each morning and take what meat I need out into the fridge for that night, well now thats its cooler I can just leave it on the sink for the afternoon to thaw. I had to write this post to remind myself of all the benefits that I personally gain through this process, it really does make my life easier, introduces new meals to my kids - and occasionally we even find one we all like! I have to start doing this too...I'm still putting it off, at least you are doing it! !